Kale is the most nutritious green leafy vegetable. According to American Dietetic Association, Foods that may offer protection from cancers contain antioxidants, phytochemicals and fiber and Kale is the one of them. Like nearly all vegetables, kale is extremely low in fat, with only 3.9 calories of fat in an average 1-cup (67g) serving. Kale is also a excellent source of protein and a good source of dietary fiber. Each serving of kale has 1g of dietary fiber. Kale is considered as a "superfood," packed with vitamins. It is an excellent source of vitamin A and vitamin C. Kale is also an outstanding source of vitamin K. It is a good source of vitamin B6 as well. It is also very high in thiamin (vitamin B1), riboflavin (vitamin B2), and niacin (vitamin B3). Kale is no slouch when it comes to minerals, either. kale, is good source of calcium that is relatively easy to absorb. It is a very good source of minerals such as calcium (9 percent daily value), copper (10 percent daily value), potassium (9 percent daily value) and manganese. Kale is also a decent source of folate, phosphorus, iron and magnesium. 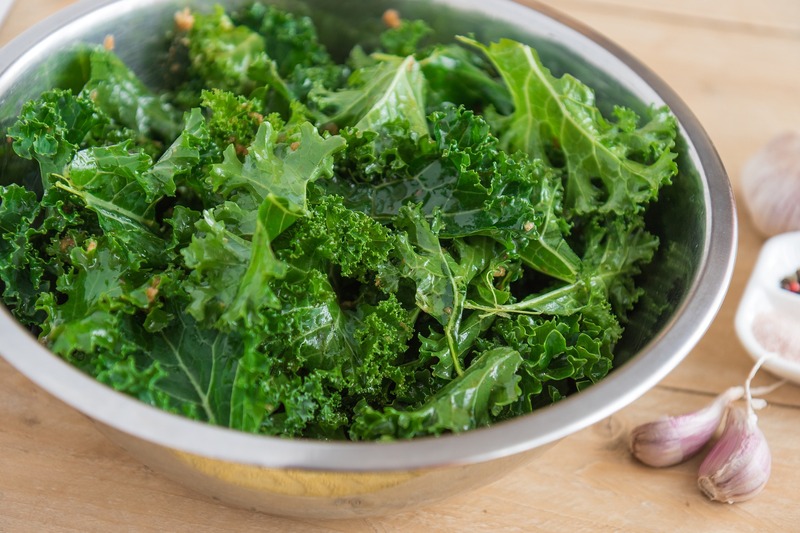 In large bowl, toss kale with olive oil until thoroughly coated. Sprinkle salt, red chili powder . Spread in a single layer on baking sheet and bake on 350 degree F until chips are crispy, about 15 minutes.